Journalist Bridget Kendall presents some of the music that accompanied her in her BBC careeer. With Shostakovich, Gershwin, Shchedrin, Bernstein, Villa-Lobos and Appalachian folk. 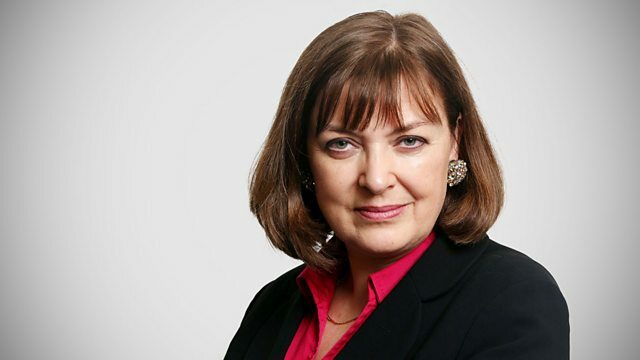 As Diplomatic Correspondent Bridget Kendall prepares to leave the BBC after more than three decades she looks back at her global postings and presents the music that accompanied her through them. From Shostakovich, Gershwin and Shchedrin in Moscow, where she reported on the fall of the Soviet Union, to Bernstein, Villa Lobos and the Appalachian folk music she experienced for the first time whilst Washington Correspondent in the mid-nineties. Plus music from Cambridge, where she grew up and is now returning to as the first female master of Peterhouse College. Music Arranger: Martin Shaw. Choir: Kings College Chapel Choir. Director: Sir David Willcocks. Performer: Christopher Hogwood. Ensemble: Early Music Consort of London. Director: David Munrow. Performer: James Thompson. Performer: Dmitry Shostakovich. Conductor: Maxim Dmitrievich Shostakovich. Orchestra: I Musici de Montréal. Singer: Willard White. Singer: Cynthia Haymon. Orchestra: London Philharmonic Orchestra. Conductor: Sir Simon Rattle. Orchestra: Moscow Virtuosi Chamber Orchestra. Ensemble: Armenian State Chamber Ensemble. Conductor: Vladimir Spivakov. Singer: Malcolm Smith. Singer: Lajos Miller. Choir: The Chevy Chase Elementary School Chorus. Choir: The Choral Arts Society of Washington. Choir: Oratorio Society of Washington. Orchestra: The National Symphony Orchestra. Conductor: Mstislav Leopoldovich Rostropovich. Narrator: David Bowie. Orchestra: The Philadelphia Orchestra. Conductor: Eugene Ormandy. Orchestra: Staatsorchester Stuttgart. Conductor: Dennis Russell Davies. Performer: Alison Krauss. Ensemble: Union Station. Singer: Barbara Hendricks. Orchestra: Royal Philharmonic Orchestra. Conductor: Enrique Bátiz. Singer: Tim Mead. Singer: Bernhard Berchtold. Choir: Chamber Choir of Europe. Orchestra: Orchester der Deutschen Handel-Solisten. Conductor: Anthony Bramall. Performer: Blue Heron. Director: Scott Metcalfe.